carimconner June 13, 2014 Gift Giving, Punches, Scallop Circle 1 3/4"
Yes. I did it. Yes. I tore out the pages of an old book to make this flower. Yes. It was psychologically difficult. I have such respect for books. 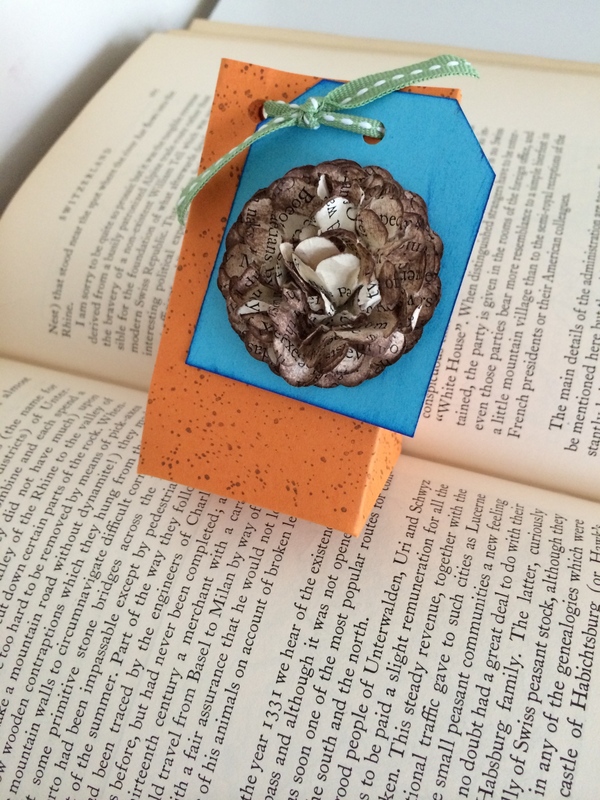 I keep seeing really cool projects using book pages or altering whole books. I guess I love them because I love books. Yet, I have always been hesitant to actually tear up a book. Even this book which I bought from a library sale from the section labelled “books for crafts.” They sold it for that purpose. The library! Isn’t that permission enough?! Yes! It was. Well, almost. I still had to look through the book first. Had to see with my own eyes that several dozen pages were already missing. Then I felt it was ok. This project took place when a friend came over to craft for a bit. She saw my little mini boxes and wanted to make one. She also saw a flower I had made from book pages (that someone else tore apart first!) and we decided to give it a try. We punched about 10-12 Scallop Cirlces from the book pages for each flower. Inked the edges with sponges, or by directly swiping the ink pad on the scallop edges. Then, we stacked the scallops and inserted a brad in the middle through all the layers. Next, we folded and scrunched each circle starting with the one on the top. Do this until you are happy with the look of the flower. Notes: If you are unhappy with the first attempt try, try again. It might work better if you dampen the scallops with a fine mist of water (try an ink that is not water soluble, or no ink at all). This flower can be made from card stock but will likely need to be dampened if so. Try it with patterned paper. Or dictionary pages. The thinner the paper, the more delicate the flower will look. Colors: Pumpkin Pie, Tempting Turquoise, Chocolate Chip, Wild Wasabi.